George Graham reviews Joe Driscoll and Sekou Kouyate's "Monistic Thoery" "Wild Pendulum"
The proliferation of world music on the American scene over the past couple of decades has brought forth a lot of interesting, creative music. But for those American ears fed on a steady diet of commercial pop, sometimes the more traditional world music releases may be a bit too much of stylistic jump. One could argue in favor of the purity of the music and that blending in Western pop into world music somehow cheapens it or robs it of authenticity. But the fact is, except for some very traditional folk music from other cultures, most of today musicians around the world have been influenced by Western pop. Especially among contemporary African styles, much of the music started out as adapting American pop. This week we have a very enjoyable new recording that combines an African musician with an American artist whose own music blends folk and rock with some hip-hop, with a stylistic fusion that is particularly appealing. It's by Joe Driscoll and Sekou Kouyate, their second joint album called Monistic Thoery. Joe Driscoll is from Syracuse, New York, and started performing as a folk musician while in his teens and eventually turned to incorporating rap and verbal beatbox into his music. He has been involved with a number of groups over the years and was signed to a British record label. Sekou Kouyate is a native of Ghana and the son of M-Bady Kouyate, a Griot who toured the world in the 1960s. Sekou followed his fathers footsteps and took up the distinctive West African harp-guitar the kora and has taken some decidedly non-traditional paths with his instrument, leading to his being called the “Jimi Hendrix of Africa.” Driscoll and Kouyate met at a music festival in Marseilles, France, in 2010, and began collaborating and touring, eventually releasing their first joint album in 2014. Ironically, this was at the height of the Ebola crisis, which hit Guinea hard, and also caused difficulty for touring due to visa problems and border customs personnel who were on the lookout for Guineans traveling across borders. But they continued to work together and toured, winning more accolades. Now they are out with Monistic Theory, which they recorded in Vermont in the midst of one of the coldest winters on record there. As they have done in the past, they work with a band, essentially a rock rhythm section with drums and bass and added percussion. Driscoll plays electric and acoustic guitar and Kouyate is on his kora, sometimes with rock-style guitar effects like distortion. In balancing the African and Western pop influences, the latter tends to predominate, but the kora is a constant sonic presence. The vocals go back and forth between the sections in what I am presuming to be the Maninka language of Guinea and the rap in English. It's interesting that the Caucasian of the duo does the rapping, while the African sings his vocals in an appealing melodic style. So lyrically going back and forth between the African sound and the rapped segments, it makes for a very obvious African-Western stylistic fusion. The English lyrics tend to be about positive things and looking at making the world a better place. One of the major factors giving this album such great appeal are the rhythmic grooves, which have some of the airy hints of polyrhythms that mark the best of African pop, with rock, funk and even Latin influence. 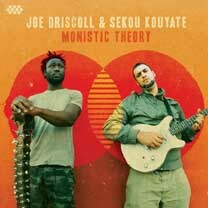 Monistic Theory, the new second joint album by Joe Driscoll and Sekou Kouyate is an appealing and creative mix of African influence with Kouyate's kora playing and Western pop, specifically some elements of hip-hop and Joe Driscoll's frequent rapping. The group's infectious rhythmic grooves give the album its biggest asset, its thorough danceability. The melodic sound of their compositions also helps to give this album the kind of appeal that should bring it to audiences who might not normally go in for African-influenced World Music. The two very different musicians are obviously having a great time making music together and that comes across. Their backup band is also first-rate keeping the sound tight. Our grade for sound quality is an A-minus, with a clean mix throughout except for an instance or two of distorted vocals on a rap part. The dynamic range, while hardly at audiophile level, is nevertheless somewhat better than the ugly hyper-compressed sound that seems to be norm these days. The recording has a good punchy sound ideal for the rhythmic drive of the music. Monistic Theory is one of those albums that should appeal to both the die-hard world music fan and those for whom world music is something or a foreign country. Its Africa-Meets-America sound is personified by both the members of the duo and the music they make.